So, when I was looked back at my blog stats after 2 years, I noticed my DIY skinny jeans post had been one of my best viewed. And I was proud of two things 1) my sewing job had withstood over 3.5 years of wearing and washing and 2) those jeans still fit. I first published this tutorial almost 3.5 years ago so I thought it was time for a little update since I've done this a few more times over the years and really think this is an easy way to update jeans if you know your way around a sewing machine in the slightest. Seriously, if you can turn it on and sew a semi-straight line you can do it! 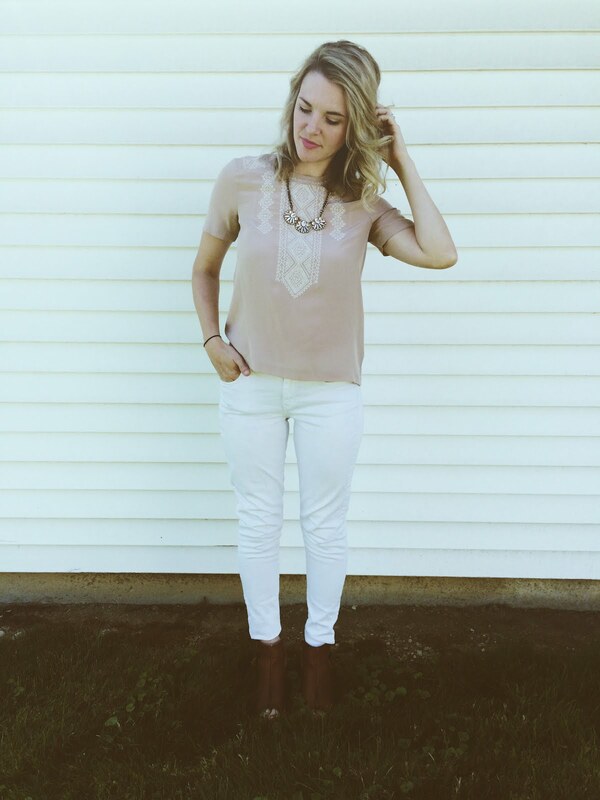 I bucked the skinny jeans trend when it first started. I was married to my bootcut jeans and thought skinny jeans only looked good on the extremely skinny which excluded me. But ya know what, if a fashion trend is around long enough, it starts to grow on you. turning them into skinnies. Guess it wasn't a real committed marriage. Update: I switched to skinny jeans and never looked back. I can't even imagine wearing other jeans now. a simple how-to and I am happy to oblige! Update: At least pretend to make your bed, Shelby. Update: I honestly have no idea what happened to these green jeans. and line them up on top of the pants you wish to alter. 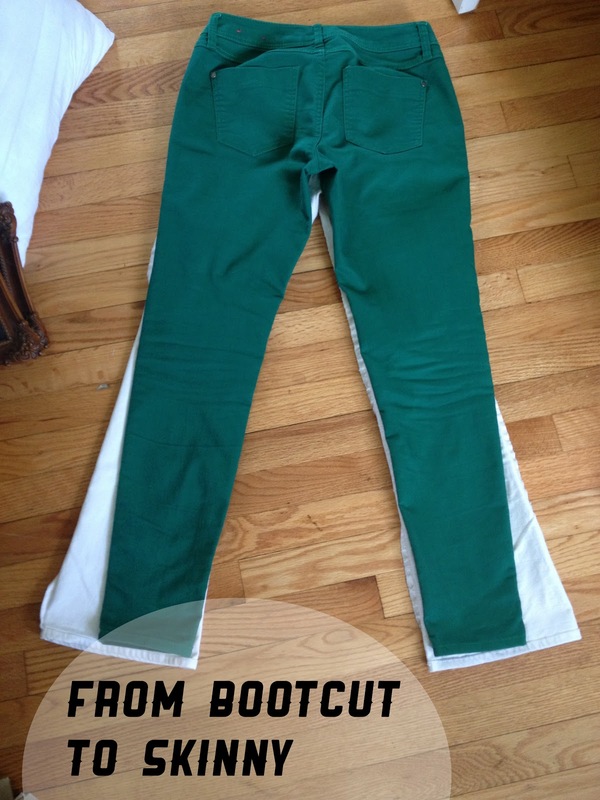 Trace the shape of the skinnies onto the pants you wish to alter. This will be the line you will sew along. Be sure to make a gradual line to the knee. It will pucker weird at the knee if you don't. I have seam ripped enough times to know. Trust. Update: This really is important. And I hate seam-ripping. Tip: If you are altering jeans, be sure to trace along the side that has the simple seam vs. the side that has the professional seam with piping. The seams won't line up right if you do your altering along the professional seam side. Sew along the line you traced. any bulk in your skinnies. 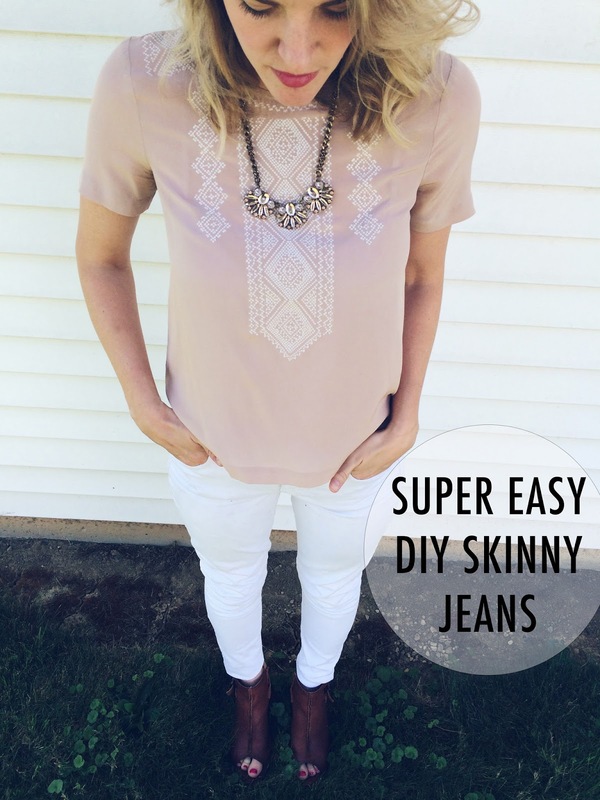 saved yourself some money by making your own skinny jeans! Update: I've experimented a bit with shortening the length too because I really like my skinnies to land right above my ankle.